All is fine and dandy with Willy Wonka's Three-Course Dinner Chewing Gum or the instant pizza from " Back to the Future." But over here in the real world, many food-science inventions have been created in the lab as imitation counterparts to real food items, and we're scarfing them down. Margarine for butter, saccharine for sugar, nondairy topping for whipped cream, to name a few - but are they actually improvements on the real thing? Slate.com just ran a profile on the newest faux food on the block, Beyond Meat, the fake meat so good "it will freak you out." Says Ethan Brown, Beyond Meat's founder, "the long-term goal is to offer a product that can satisfy the world's growing, and largely unsustainable, demand for meat, especially in ballooning markets like India and China. Unlike most imitation food products, Beyond Meat doesn't include a shamefully long laundry list of artificial ingredients, just a few questionable ones (like dipotassium phosphate and titanium dioxide). Regardless, it's a highly processed affair and requiresthe use of natural resources to turn soy beans into counterfeit flesh. Solving the world's demand for meat with a vegan product is laudable for health, environment and animal welfare considerations. But it's starting to feel a bit too Isaac Asimov, where overpopulation leads to a world with little meat, and in it's place people are fed vat-grown artificial yeast-based proteins. Is the Jetson's meal-in-a-pill far behind? Aside from Beyond Meat, here's a look at a few of the many other ersatz foods born in the test-tube and adopted by the masses. 1. Whipped cream There's no telling just how long people have been whipping high butterfat dairy into the colloid known as whipped cream, but there are plenty of written references to it in the 16th century when it was commonly referred to as milk-snow. What we do know is that the world's first nondairy whipped topping, Cool Whip, was invented in 1966. Created by chemist William A. Mitchell - also the mastermind behind Pop Rocks, Tang, quick-set Jell-O and powdered egg whites - the invention was intended to afford convenience as a frozen product with an extended fridge life. Two years after Birds Eye introduced the product, it became the company most profitable product. Now owned by Kraft, it continues to sell like hotcakes. So what's the magic behind a whipped "cream" that can maintain its whipped-creaminess for days, even out of the refrigerator? The secret is, no cream in the whipped cream! Actually, as of 2010 Kraft started adding cream to Original Cool Whip, but it hasn't had much effect on its remarkable stability. What's the problem with Cool Whip? How's this: Water, Hydrogenated Vegetable Oil (Coconut and Palm Kernel Oils), High Fructose Corn Syrup, Corn Syrup, Skim Milk, Light Cream, Sodium Caseinate, Natural and Artificial Flavor, Xanthan and Guar Gums, Polysorbate 60, Sorbitan Monostearate, Beta Carotene (Color). So, basically, you could opt for organic heavy cream whipped with a little sugar, or a foamed oil product with a host of superfluous chemicals. 2. Fake butter Oh how the mighty have fallen. How did beautiful butter slide down the slippery slope into the class of products known as butter flavor sprays? Fake butter had a noble start when in the 19th century Louis Napoleon III of France sought a satisfactory substitute to provide buttery pleasure for the armed forces and lower classes. A butter-like emulsion, oleomargarine, was invented, and its primary ingredient was beef fat. Following the Depression and war rationing, American food makers came up with vegetable-based margarine, which eventually surpassed consumption of real butter. By the end of the 20th century, the average American ate around 5 pounds of butter and nearly 8 pounds of margarine. Although the trend is reversing, many brands of stick margarine have often been high in trans fat - the bad fat that increases bad cholesterol and lowers good cholesterol. Softer margarine spreads have less hydrogenated oils and are thus lower in trans fat, but questions remain about the use of vegetable oils. When you swing to the other end, liquid buttery sprays, it's not so pretty either; they are often chock-a-block with additives that go miles beyond cream and salt: Emulsifiers, preservatives, acidulants and artificial flavors and colors to name a few. Stick with Julia Child on this one: "If you are afraid of butter, use cream!" 3. 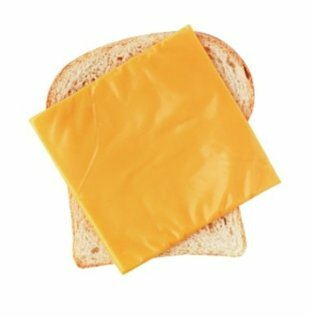 Cheese products American cheese - or should we say, "pasteurized prepared cheese product" - was first patented in the United States in 1916 by James Lewis Craft as a way to provide a tinned cheese with a longer shelf life for soldiers. The initial version was revolutionary, but simple enough. Further cheese inventions by Kraft brought us the giant glowing loaves of processed cheese known as Velveeta in 1928, and processed cheese slices in 1950. Fast forward 60 years and the Kraft Singles family has grown to include a variety of new flavors and fat-content options. More than the basic components required to make cheddar cheese - milk, enzymes, salt and annatto - Kraft Singles are a stunning conglomeration of ingredients, including: Milk, Whey, Milk Protein Concentrate, Water, Sodium Citrate, Calcium Phosphate, Milkfat, Salt, Gelatin, Sodium Phosphate, Cheese Culture, Lactic Acid, Sorbic Acid as a Preservative, Oleoresin Paprika and Annatto (Color), Enzymes, Vitamin A Palmitate, Vitamin D3. With comparable calorie and saturated fat content to real cheese, and often available at a similar price point, why would anyone want a processed version filled with chemicals? 4. Sugar wannabes The curious history of non-nutritive sweeteners goes something like this. Saccharine was the first artificial sweetener, discovered in 1879 by a scientist working on coal-tar derivatives (that should say enough right there). Although it faced early threats of a ban in 1911, saccharin soared in popularity. But saccharin's unpleasant metallic aftertaste led to the invention of another sweetener in 1951 called cyclamate. By 1968, Americans were consuming more than 17 million pounds of the calorie-free cyclamate a year in snack foods, canned fruit and diet sodas - until it was banned in 1969 for causing cancer in lab animals, that is. In 1977, saccharine got in trouble because it was linked as a possible contributor to cancer in rats. An FDA move to ban the chemical failed, though products containing saccharin were required to carry warning labels. In 2000, the chemical was officially removed from the federal government's list of suspected carcinogens. (Although it is still banned in other countries). The synthetic compound aspartame was approved for use in 1981, but was then victim to all kinds of bad press linking the chemical to everything from multiple sclerosis to Gulf War syndrome. While aspartame does adversely affect some people - repeated tests deem it safe. The basic gist is that scientists and regulating agencies can't agree on the safety of artificial sweeteners. If you follow the precautionary principle and consume only those items positively known to be safe, then artificial sweeteners probably aren't on your green-light list. Same goes if you prefer eating wholesome, natural foods over artificial facsimiles. 5. Fake crab meat Also known by the more poetic name, surimi, the pulverized and reconstructed fish product has played a role in Japanese cuisine for centuries. As an early cultural marker of molecular gastronomy, it's pretty cool. But things have gone a bit haywire and now the product is mass-manufactured, highly processed, and includes a bevy of artificial ingredients that make it a far cry from the food-thing formerly known as fish.